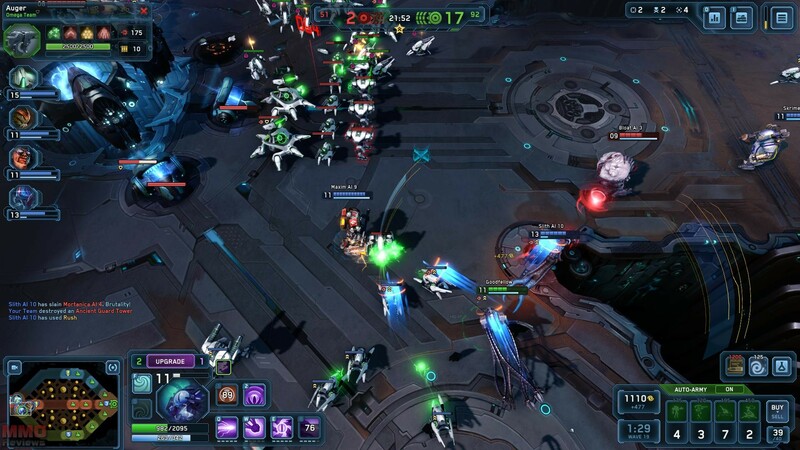 Completely free to play Supernova is the next stage of MOBA giving players control of not only their own character but their own army of minions in the same fast paced three lane base attack gameplay. Working alongside and against other players the game offers challenging and strategic team based PVP, strong elements of customization and a variety of unique features. Supernova is a traditional style MOBA that allows two 5-man teams to go up against each other in a team based objective battle where both teams are tasked with pushing their troops into the enemy base to destroy their Auger. Using classical three lane maps players must navigate and fight past lane turrets, enemy waves and other players by controlling their Commander to assist their and their allies Armies. Gaining XP for kills players slowly level up through the duration of the game and unlock new abilities as well as increasing their attributes to make themselves more powerful. With both teams following the same objective players must learn to work together whilst balancing their offensive game with a defensive one. Evacuate – The Evacuate skill requires no energy and has no cooldown and once triggered will summon a personal ship after ten seconds, providing the call isn’t disturbed, that will evacuate the Commander back to their home base. Here players can replenish their health and energy as well as spend Attribute Points to increase their attributes and Mastery Points to increase Commander traits. The biggest difference with Supernova and other MOBA is the minion wave metagame, where each Commander is responsible for acquiring resources to construct and outfit their own wave of minions/Army troops, to push down the lane. Players must learn to multi-task both controlling their player and maintaining their wave by upgrading it, acquiring new troops (ground and air) and monitoring the Armies window to see how their troops perform each wave against the enemy. As players level up they will gain access to better units to add to their Commanders arsenal making them an even deadlier force.